A smoking pipe, often called simply pipe, is a device specifically made to smoke tobacco. It comprises a chamber for the tobacco from which a thin hollow stem (shank) emerges, ending in a mouthpiece (the bit). Pipes can range from very simple machine-made briar models to highly prized hand-made artisan implements made by renowned pipe-makers, which are often very expensive collector’s items. The bowls of tobacco pipes are commonly made of briar wood, meerschaum, corncob or clay. Less common are other dense-grained woods such as cherry, olive, maple, mesquite, oak, and bog-wood. Minerals such as catlinite and soapstone have also been used. Pipe bowls are sometimes decorated by carving. Unusual, but still noteworthy pipe bowl materials include gourds, as in the famous calabash pipe, and pyrolytic graphite. Metal and glass are uncommon materials for tobacco pipes, but are common for pipes intended for other substances, such as cannabis. The stem needs a long channel of constant position and diameter running through it for a proper draw, although filter pipes have varying diameters and can be successfully smoked even without filters or adapters. Because it is molded rather than carved, clay may make up the entire pipe or just the bowl, but most other materials have stems made separately and detachable. Stems and bits of tobacco pipes are usually made of mold-able materials like vulcanite, lucite, Bakelite, and soft plastic. Less common are stems made of reeds, bamboo, or hollowed out pieces of wood. Expensive pipes once had stems made of amber, though this is rare now. Pipe tobacco can be purchased in several forms, which vary both in flavor (leading to many blends and opportunities for smokers to blend their own tobaccos) and in the physical shape and size to which the tobacco has been reduced. Most pipe tobaccos are less mild than cigarette tobacco, substantially more moist and cut much more coarsely. Too finely cut tobacco does not allow enough air to flow through the pipe, and overly dry tobacco burns too quickly with little flavor. Pipe tobacco must be kept in an airtight container, such as a canning jar or sealed tin, to keep from drying out. Some pipe tobaccos are cut into long narrow ribbons. Some are pressed into flat cakes which are sliced. Others are tightly wound into long ropes, then sliced into discs. Flake tobacco (sliced cakes or ropes) may be prepared in several ways. Generally it is rubbed out with the fingers and palms until it is loose enough to pack. It can also be crumbled or simply folded and stuffed into a pipe. Some people also prefer to dice up very coarse tobaccos before using them, making them easier to pack. The majority of pipes sold today, whether hand made or machine made, are fashioned from briar (French: bruyère). Briar is a particularly well suited wood for pipe making for a number of reasons. The first and most important characteristic is its natural resistance to fire. The second is its inherent ability to absorb moisture. The burl absorbs water in nature to supply the tree in the dry times and likewise will absorb the moisture that is a byproduct of combustion. Briar is cut from the root burl of the tree heath (Erica arborea), which is native to the rocky and sandy soils of the Mediterranean region. Briar burls are cut into two types of blocks; ebauchon and plateaux. Ebauchon is taken from the heart of the burl while plateaux is taken from the outer part of the burl. While both types of blocks can produce pipes of the highest quality, most artisan pipe makers prefer to use plateaux because of its superior graining. Meerschaum (hydrated magnesium silicate), a mineral found in small shallow deposits mainly around the city of Eskişehir in central Turkey, is prized for the properties which allows it to be carved into finely detailed decorative and figural shapes. It has been used since the 17th century and, with clay pipes, represented the most common medium for pipes before the introduction of briar as the material of choice in the 19th century. 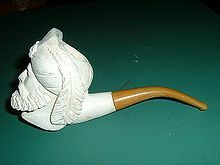 The word “meerschaum” means “sea foam” in German, alluding to its natural white color and its surprisingly low weight. Meerschaum is a very porous mineral that absorbs elements of the tobacco during the smoking process, and gradually changes color to a golden brown. Old, well-smoked meerschaum pipes are valued by collectors for their distinctive coloring. In selecting a meerschaum pipe it is advisable to verify that the product is indeed carved from a block of meerschaum, and is not made from meerschaum dust collected after carving and mixed with a binder then pressed into a pipe shape. These products are not absorbent, do not color, and lack the smoking quality of the block carved pipe. Clay in this case is almost always a very fine white clay. Low-quality “clay” pipes are actually made from porcelain slip poured into a mold. These are porous, of very low quality, and impart unwanted flavors to a smoke. Top-notch clays, on the other hand, are made in a labor-intensive process that requires beating all air out of the clay, hand-rolling each pipe before molding it, piercing with a fine wire, and careful firing. Traditionally, clay pipes are un-glazed. Clays burn “hot” in comparison to other types of pipes, so they are often difficult for most pipe-smokers to use. Their proponents claim that, unlike other materials, a well-made clay pipe gives a “pure” smoke, with no flavor addition from the pipe bowl. In addition to aficionados, reproductions of historical clay styles are used by some re-enactors. Clay pipes were once considered disposable items and the rapidly changing designs in the past are often used as an aid in dating by archaeologists. They were once very popular in Ireland, where such a pipe was called a dúidín. Calabash gourds have long made prized pipes, but they are labor-intensive and, today, quite expensive. Because of this expense, pipes with bodies made of wood (usually mahogany) instead of gourd, but with the same classic shape, are sold as calabashes. Both wood and gourd pipes are functionally the same. They consist of a downward curve that ends with an up curve where the bowl sits. Beneath the bowl is an air chamber which serves to cool, dry, and mellow the smoke. There are also briar pipes being sold as calabashes. These typically do not have an air chamber and are named only because of their external shape. A calabash pipe is rather large and easy to recognize as a pipe when used on a stage in dramatic productions. Early portrayals of the character Sherlock Holmes, took advantage of this fact when it was required to portray Holmes smoking. This is why Holmes is stereotypically depicted as favouring a calabash. In fact, most stories, particularly The Adventure of the Copper Beeches, described him as preferring a long-stemmed cherry-wood or a clay pipe. On the other end of the scale, pipes made from corn cobs are cheap and effective, even if some regard them as inelegant. The cobs are first dried for two years. Then they are hollowed out to make a bowl shape. The bowls are dipped in a plaster-based mixture and varnished or lacquered on the outside. Shanks made from pine wood are then inserted into the bowls. The first and largest manufacturer of corncob pipes is Missouri Meerschaum, located in Washington, Missouri, in the USA. Missouri Meerschaum has produced the pipes since 1869. General Douglas MacArthur, Mark Twain, and Norman Rockwell were perhaps the most famous smokers of this type of pipe, along with the cartoon characters Popeye and Frosty the Snowman. Corncob pipes remain popular today because they are inexpensive and require no “break-in” period like briar pipes. For these two reasons, corncob pipes are often recommended as a “Beginners pipe.” But, their enjoyment is by no means limited to beginners. Corncob pipes are equally valued by both learners and experienced smokers who simply desire a cool, clean smoke. Pipesmokers who wish to sample a wide variety of different tobaccos and blends also might keep a stock of corncobs on hand to permit them to try new flavors without “carryover” from an already-used pipe, or to keep a potentially bad-tasting tobacco from adding its flavor to a more expensive or favored pipe. A variety of other materials may also be used for pipes. The Redmanol corporation manufactured pipes with translucent stems in the 1920s and a series of pipes was manufactured and distributed by the Tar Gard (later Venturi) Corporation of San Francisco from 1965-1975. Marketed under names such as “the pipe,” “THE SMOKE” and “Venturi,” they used materials such as pyrolytic graphite, phenolic resin, nylon, Bakelite and other synthetics, allowing for higher temperatures in the bowl, reduced tar and aesthetic variations of color and style. After Venturi stopped making pipes, several companies continue to make pipes from Brylon, a composite of nylon and wood flour, as a cheaper substitute for briar. 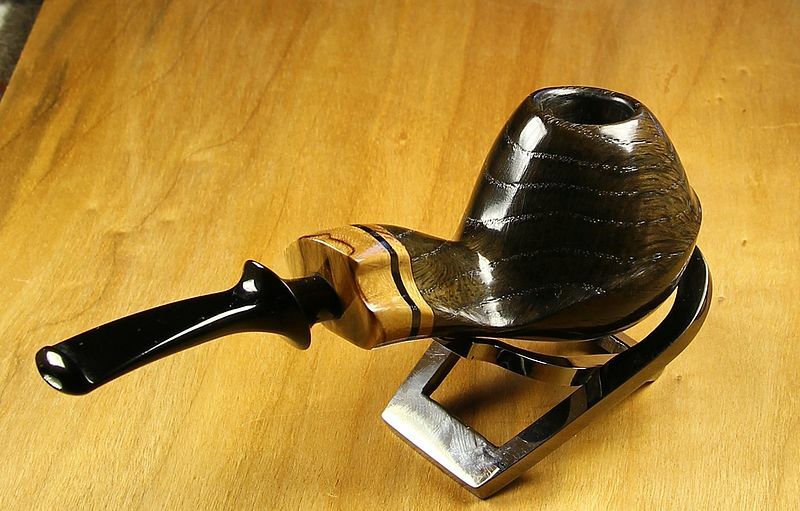 Metal is an uncommon material for making tobacco pipes, but they are not unknown. The most common form of this is a pipe with a shank made of aluminum, which serves as a heat sink. Mouthpieces are made of vulcanite or lucite. The bowls are removable, though not interchangeable between manufacturers. They are made of varying materials to allow the smoker to try different characteristics or to dedicate particular bowls for particular tobaccos. Other metal tobacco pipes include the very small Japanese kiseru and Arabian midwakh. Hookahs also may have metal stems, but fall into the general category of water pipes.